This is my first serious attempt at Astrophotography. I drove about 30 miles north of my home to a much darker site with my camera tripod, a Vixen Polarie Star Tracker that my wife bought me for Christmas, and my Sony A7II Camera with a 55mm f/1.8 lens. Once I was far enough north of Imlay City, Michigan to eliminate that city's glow in the night sky, I saw the North Goodland Baptist Church on the side of the road, set back pretty far, with a grassy field beside and behind the church building. I went into the church to ask permission to photograph the sky from the church grounds from about 10 PM to midnight, and the pastor graciously gave me permission to do so. Hoping that no parking lot lights would come on, I actually just setup my tripod, tracker and camera at the edge of the parking lot, next to my car. I set my camera to take a 25-second raw exposure at f/2.8 and ISO 100, with long-exposure-noise-reduction set to ON. That noise reduction algorithm takes another 25-second exposure without opening the shutter at the end of each normal 25-second photo, and subtracts any "hot" pixels in that dark frame from the exposed frame in order to cancel-out the electrical noise which would otherwise appear in each image due to heat build-up. I polar aligned the star tracker so it would keep my camera pointed at the same piece of sky all night, I manually focused the camera on the stars, setup an intervalometer to take a photo every 55 seconds, started up the Star Tracker, and started the camera shooting. Then I left the camera to itself and reclined in my car seat and read an ebook about photographic composition on my iPad while my camera snapped 123 photos, until about 20 shots after I noticed a high haze develop in the sky, reducing the visibility of the stars. Yes, you read that correctly, I snapped 123 photos of the exact same spot in the sky. When you first thought I might be a little bit strange, you were probably underestimating things. The first shot was at 10:10 PM, and the last was at midnight, by which time I was ready to drive home and see what I'd captured on my tiny SD card. At home, I exported those 123 photos (yes, there really were 123 photos of the same spot in the sky) as TIF files, and ran them through DeepSkyStacker 3.3.2, some freeware I'd downloaded. (I'm recording all these details so I might have a chance at remembering them when I next attempt this feat.) That software aligns and combines all the photos, eliminating the spurrious satellite pass-throughs and combining the very faint but consistent pixels in each photo to come up with a single photograph equivalent to a 51-minute exposure of this star field (that's 123 times 25 seconds). I imported the resulting photograph into LightRoom and enhanced it by setting up a proper black point, white point and contrast. I also enhanced the red channel a bit to make the nebulas stand out a bit better. The image below is the result. Be sure to click it for a full resolution epiphany. To many of you that'll just look like salt spilled onto some black paper, but let me help you make some sense of what is shown. Below is a marked-up version of that same photo. The Christian Cross running sideways through the photo is the easily-visible asterism of Cygnus, the Swan. You can see this easily with your naked eye, even in light-polluted city skies, in the eastern sky right after dark during early summer in the northern hemisphere. Each night it's just a little bit higher in the eastern sky. Tonight, on August 2nd, it was high in the east at 10 PM and nearly overhead at midnight. In the autumn it will be in the west as it sets soon after dark, and rotated such that the cross will be more upright. Cygnus, 123 Stacked 25-second images at 55mm, f/2.8, iso100, with long exposure noise reduction enabled on each. We live in a galaxy named the "Milky Way". If you travelled really really far away, you'd find it's shaped like a pancake with a ping-pong-ball in the center. We live inside the pancake batter, about 2/3 of the way out from the center to the edge. When we look at Cygnus, we're looking through the pancake batter, not up or down out of the pancake, but straight through the pancake, and not quite toward the center of the galaxy (that's in Sagittarius, not Cygnus). The multitude of stars which show nicely in this photograph and form the glow of the Milky Way to our naked eyes are other stars located within the pancake. The darker band running horizontally through the photo just below the center is made of clouds of dust which obscure our view to the stars beyond those clouds which we'd otherwise be able to see. This dust, running through Cygnus, is called "the Great Rift", as it breaks the glow of the Milky Way in half as it runs through Cygnus. 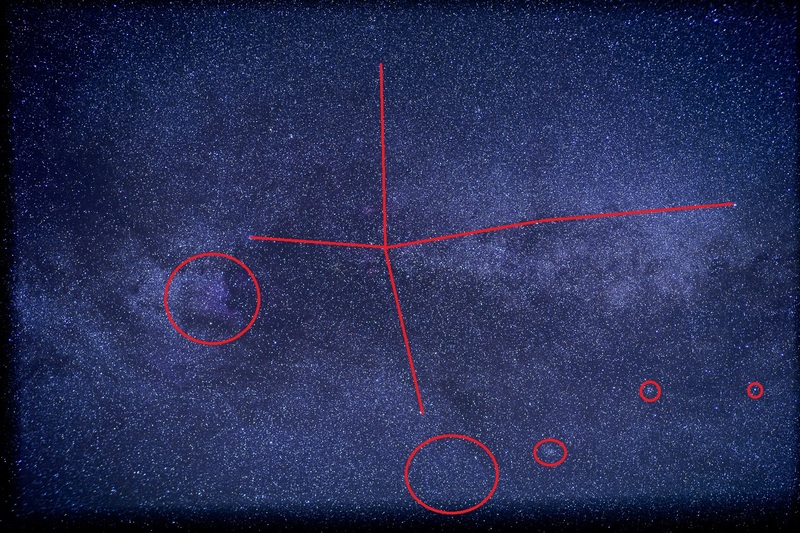 The circled regions on the photo above are parts of the image of interest to astronomers because they are objects which are pretty to look at, for the amateur astronomer, or objects which can be used to learn about physics, for the professional astronomer. The most prominent is the left-most circle. This is called the "North America Nebula", because it is shaped like the North American continent. It is shown in the central third of the close-up photo below. North America is tilted about 45 degrees. I hope you can make out the United States, with Mexico coming out of its lower-left, perhaps Florida along the right edge, and Hudson Bay, in northern Canada, at its upper-left. If you can't make it out from the close-up from my photo, below, check out its wikipedia article, but be sure to come back here when you're finished. The North America Nebula is also known as NGC 7000. As with many nebulae of this type, the North America Nebula is a region where the dust has been compressed enough for whatever reason that it has started to form stars, like our sun. The light from those young stars is quite intense and causes the remaining dust to glow, and by some odd coincidence, this glowing dust is shaped, from our point of view, like the continent of North America. When these bright stars run their course, perhaps a billion years from now, they'll explode as supernovae, and compress the dust in some neighboring region enough that it begins forming stars, and the Milky Way will continue its cycle of star birth and death. Hey, did somebody mention a supernova? There's actually the remains of one in this photo, too. Jeez, I'll bet I have you really excited now! In the annotated version of the photo, it's in the large circle at the bottom, and I've zoomed-in to that part of my photo in the close-up below. I know that by now your hearts are pounding furiously and your body can hardly take any more of this excitement, you're an astronomer now and you need to just buck up; there are 3 small circles still to come! 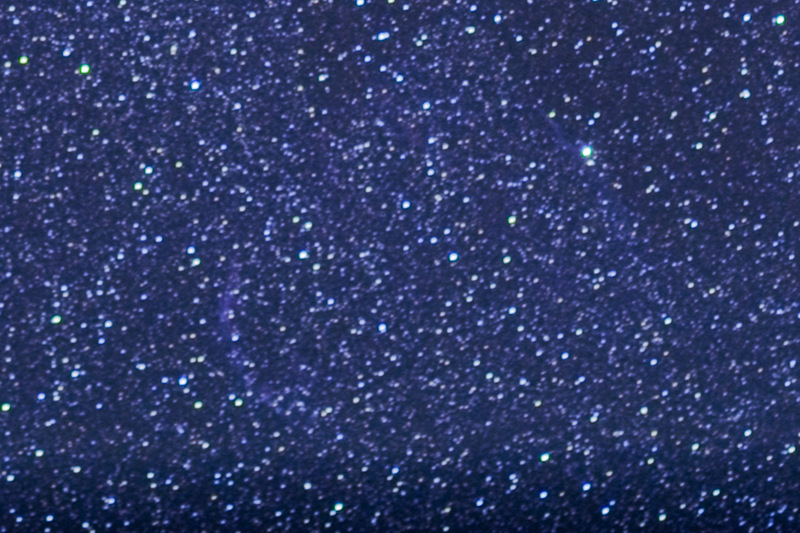 We'll take these circles from left-to-right, starting with the one nearest to the Veil Nebula. That first one is none other than NGC 6940. Now, NGC might not mean a whole lot to the average layman, but it was quite a bombshell to the astronomical community, of which you can now be considered a member due to your persistance in reading this far. Before the NGC, or New General Catalogue, there were many small catalogs of astronomical objects. It all started with Charles Messier's list of about 110 objects which he didn't want to confuse with comets. You see, he was only interested in observing comets, and these fuzzy spots in the sky looked a lot like comets and he was always getting confused by them when he was searching for new comets, so he made himself a catalog of spots to avoid looking at. Those 110 objects, which he wanted to avoid looking at, are the 110 most prized objects for today's amateur astronomers to hunt down and see with their telescopes. Other subsequent astronomers made their own lists of handfulls to hundreds or even thousands of objects in the sky, until in 1888 J.L.E. Deyer, combined all of these catalogs into one super catalog of 7,840 objects which he named the New General Catalog (NGC), of which this is the 6,940th object. I've zoomed-in to my photo on Deyer's 6,940th NGC object below because darn if it's not a doosey! 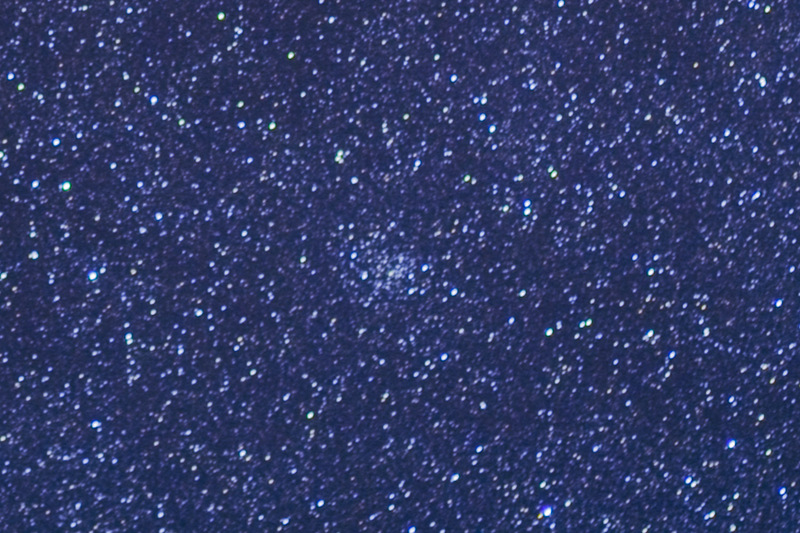 The second small circle on my annotated photograph is NGC 6885, another open cluster in Deyer's list, shown in the close-up below. 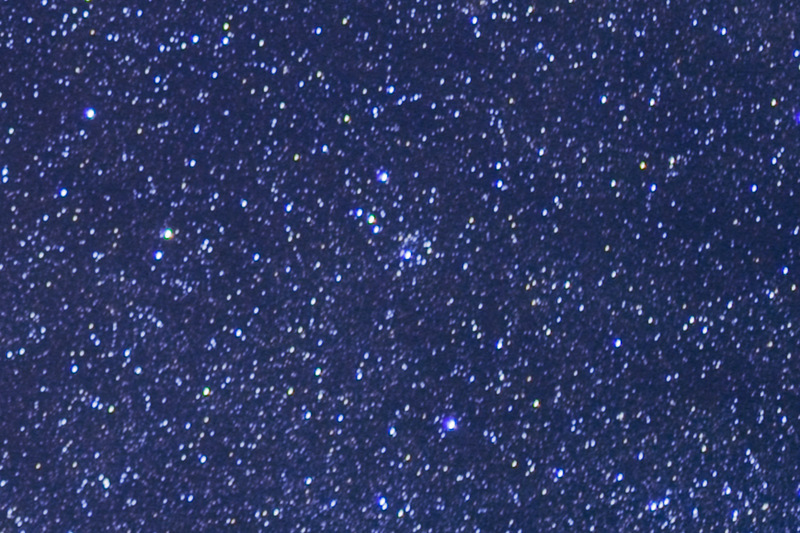 Visually, through a telescope, NGC 6885 is a lot more difficult to see than most open clusters. Based on what I read of my observing notes from 6 observations of this cluster from 1985 through 1990, I'm still not entirely convinced that I had the precise spot in the sky where this cluster is located. One of these years (jeez, I'd better make it fast before it's too late) I'll need to try again, based on what I photographed tonight in two hours of lounging around and reading an e-book in a church parking lot north of Imlay City. And the final object I've circled in this star field, way at the lower-right corner of the photograph, is Messier 27, also known as the Dumbell Nebula, or NGC 6853. This is the "other" type of nebula from the North America Nebula, known as a planetary nebula. The North America Nebula is an area of star formation. The Dumbell Nebula is an area of star death, more akin to the Veil Nebula, except the Veil Nebula is the remnant of a star explosion, the death of a star much more massive than our sun. The Dumbell Nebula, on the other hand, is the remanant of a star more similar in size to our sun. It's the result of a star gently puffing up to a large size after it exhausts its supply of energy, similar to what our sun will do about 5 billion years from now. 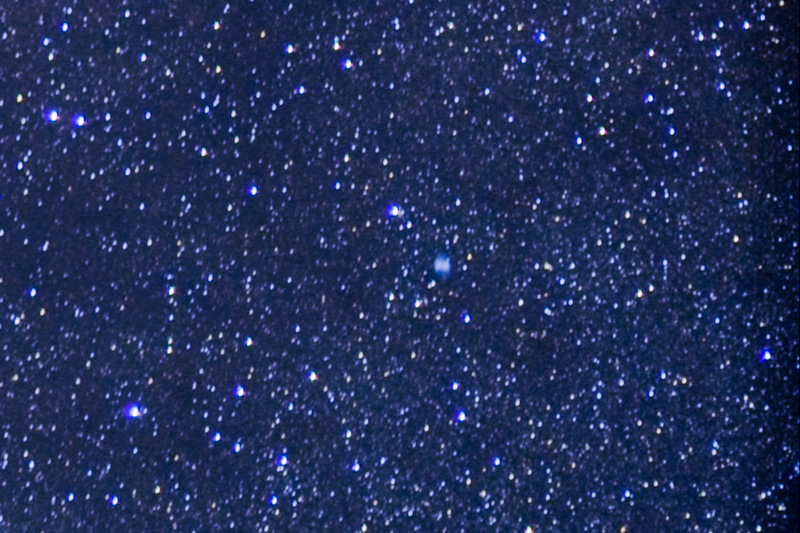 A closeup from my photo is below (M27 is the small apple-core-shaped object just to the right of center), but much better images taken at much higher magnification can be found throughout the internet. Visually through an amateur telescope, M27 looks like an apple core, or a dumbell. Oh, and the darker edges are caused by the batteries in the Star Tracker running down a little bit, so the stars drifted a little bit. That meant the edges of the photo did not have a full 123 photos contributing to them, and were therefore darker. Instead of removing the dark edges, I left them alone since the Veil Nebula is near that lower darkened edge. I guess 2 AA batteries only power the device successfully for about an hour and either should be replaced after that, or else I should plug a more powerful cell-phone-recharging battery into the power jack on the Star Tracker instead of using AA batteries. So there you have it. Two hours with a camera, working extremely hard while reclining in my car, listening to the crickets, reading an ebook about how to create better photographs, enjoying my retirement, all to sacrifice myself and bring such wonders of the universe to your phone or PC. 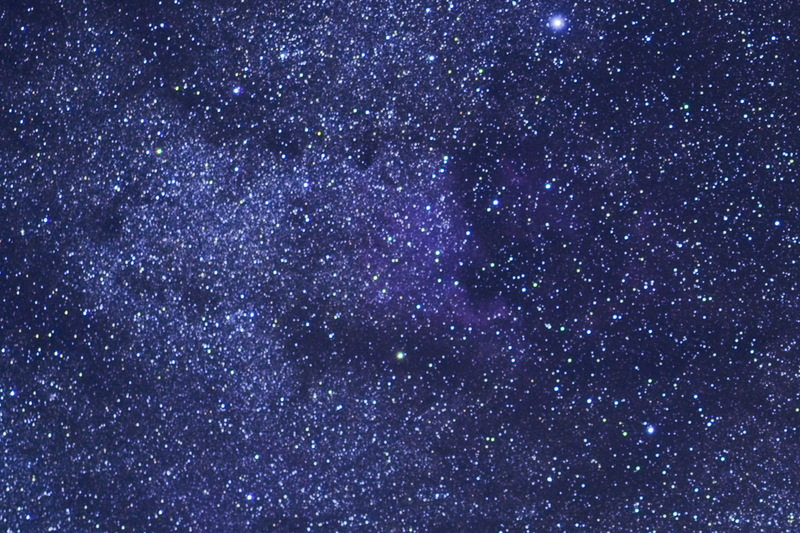 There are 88 constellations in the sky, just as there are 88 keys on a piano (odd coincidence, is it not?). Cygnus is hereby the first of those constellations on my astrophotographic journey, and only 87 constellations remain to be photographed and dissected! Paulette will be thrilled by this news! But Paulette, if you've read this far, please remember that those 88 constellations are just handfulls of salt thrown onto the black velvet of infinite space, and are far surpassed by you, the source of all good things and the center of my life, enveloping the core of my being.